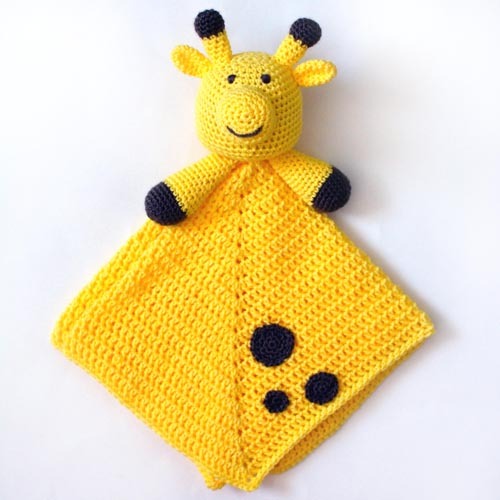 Crochet this giraffe lovey for a little boy or girl who can use an extra snugly friend. The security blanket makes a great gender neutral gift for a baby shower. The giraffe is crocheted amigurumi style and then attached to a small square blanket. All of the pieces are crocheted seamlessly in the round, like a spiral. This entry was posted on Sunday, April 22nd, 2018 at 12:00 AM by Rachel Choi	and is filed under Best Crochet Patterns. You can follow any responses to this entry through the RSS 2.0 feed. You can skip to the end and leave a response. Pinging is currently not allowed.